It looks like coal is destined to overtake oil as the top energy source by the year 2017. While coal does bring less CO2 emissions than standard fossil fuels, it is by far not the answer to address the environmental problem. This doesn’t seem to make a difference, as the consumption is increasing in every location except the U.S. The demand for coal as one of the top energy sources sped up to unprecedented rates over the last ten years. It has slowed down a bit, with China being the top consumer and India coming in second as well as being the top seaborne importer of coal. According to IEA, the latest report is showing that around the globe, the estimate will be that by the year 2017, 1.2 billion tons of coal will be burned each year. The increase is comparable to the current coal consumption of the U.S. and Russia, combined. The world wide love affair with coal touches about every country, but in the U.S., it is natural gas that reigns supreme. This unique situation is based on the assumption that a more efficient gas market, combined with flexible prices and the ability to locate gas via unconventional resources has brought an alternative to coal use. 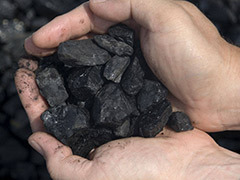 Coal, compared to oil does reduce CO2 emissions as well as trickling down to the average consumer in the reduction of electricity costs, but it remains a high pollution resource when compared to renewable energy sources. The tides, however, may be making a change in China, as they are investing in their own internal renewable and sustainable energy infrastructure and it is anticipated that their high demand for U.S. coal will be drastically reduced. Up to now, U.S. coal companies have been exporting huge quantities of coal to China and that cash cow may be drying up soon. Posted on July 4th under Non Renewable Energy Sources. I had heard that the high demand for natural gas in this country has resulted in the ‘fracking’ problems. They drill deep into bedrock and areas that contain natural gas and then fill the holes with water to release the gas. The results have been that many areas have had sink holes and ground collapses. So much for the next best thing in energy. China is making the changeover to renewable energy. They have to. Their country is so polluted there are areas that people can’t even live in safely. India probably won’t be far behind. Shouldn’t take long for the U.S. to actually look up and realize that other countries are moving past us and the big dollars are gone in the coal topic. Too bad, because America could be ahead of the game on that side. Since when is coal considered a good energy source? It still pumps out a ton of carbon emissions and is in no way comparable to renewable energy. Why aren’t we investing in those options? Let China have the coal if they want it. But it sounds like they are getting smart and putting money into their own energy areas.